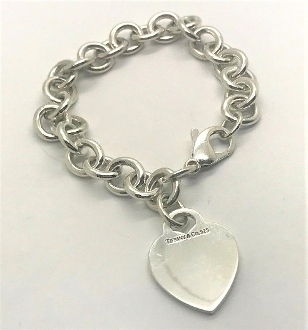 Tiffany & Co. 925 Heart Tag Sterling Silver Bracelet 7.5"
Our Products >> Tiffany & Co 925 Heart Tag Sterling Silver Bracelet 7.5"
Condition: Excellent estate condition, normal signs of wear. 100% Genuine T & CO.!! All Tiffany & Co sterling silver is part of a rich heritage of innovation and design. Tiffany’s silver studio won top awards at the great world’s fairs of the late 19th century. Tiffany also originated the .925 sterling silver standard of purity in the United States, later adopted by the nation. You can also view our other estate auctions for even more rare retro finds, antiques, coins, bullion and hand selected fine jewelry pieces. All items have been tested and verified to be as described by our staff of professional jewelers. Authenticity always 100% guaranteed genuine! All designer, signed, vintage, retro, estate, antique, fine, fashion, and or trademarked jewelry is pre-owned and pre-loved therefore signs of wear may show, which is consistent with use and age unless described as MINT condition. For example slight scuffing on band, worn down hallmarks, etc. Our pictures are a visual description of the piece you are bidding on. We always make our best effort to state the maker, branded name, trademarked company info, etc. In some cases we will refer to the piece as designer signed and reference the maker; such as T & Co (Tiffany & Co) when applicable. All Precious Metals have been acid tested and verified to be the Karat stated in our description. If available we will have a photo of said hallmark/makers mark. Inconsistencies may occur in handmade, native jewelry, or jewelry with natural stones, only adding to the uniqueness and appeal of the piece. Tiffany & Co 925 Heart Tag Sterling Silver Bracelet 7.5"